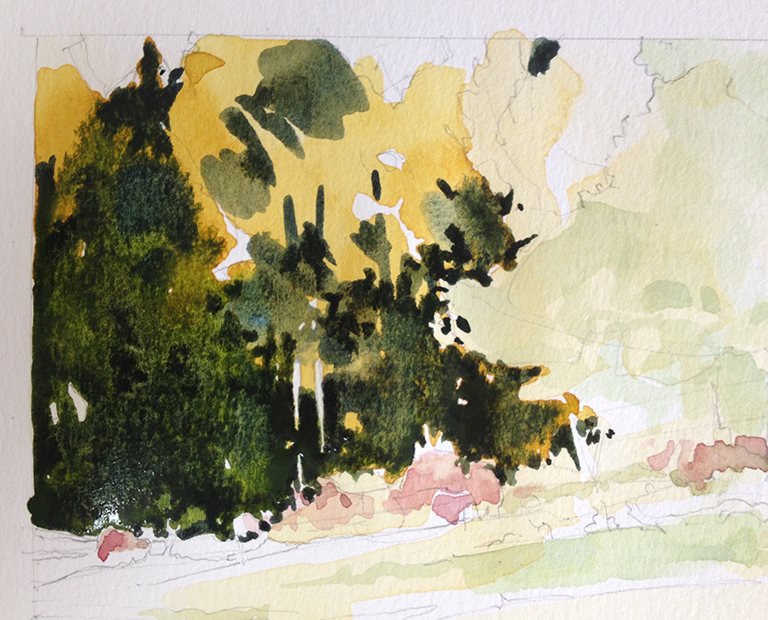 Whether one is working up a large and complex piece or the smallest of watercolor sketches, getting started well can be one of the most important, even crucial, parts of the process. When I start a piece badly or in a confused manner, I end up having to struggle so much harder to get it all worked out, Now don’t get me wrong, getting lost in that struggle can be a wonderfully fertile process. I find that wandering about in a painting project and searching for a way through that visual disorientation can eventually open up new and exciting pathways in my work. But starting a new work, staying focused on my original vision, and following through as best I can be a very productive path as well. 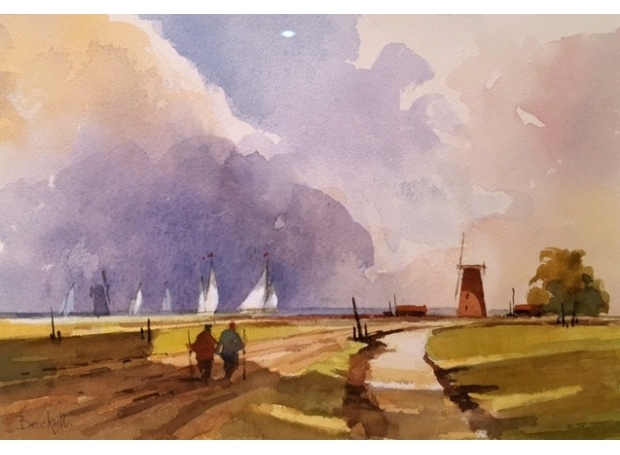 A good example of this can be seen in Shari Blaukop’s latest posting about her approach to watercolor sketching.. It is quite close to my way of working up a smaller pieces and she does a really great job of verbally and visually explaining her process. 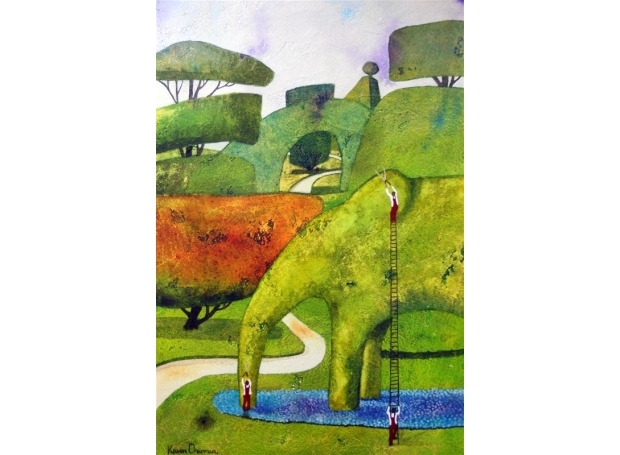 Shari is a Montreal based artist whose painting and blog I have known and enjoyed for several years now. I even had the pleasure of meeting her this past summer when we were both in Chicago for the Urban Sketcher’s Symposium. Take a look at her blog post. I think you will find Shari’s painting and writing to be fresh, evocative, and engaging. Blue? Oh Yes … I LOVE Blue. My first favorite paint color was Prussian Blue! I have gotten older and painted with many other wonderful blue colors. I think that maybe, just maybe Prussian Blue is still my favorite. As a young kid, my box of 64 colors had several blues. There were light blues, bright clear blues, and a darker blue to be sure. Maybe that was navy blue … but I don’t remember anything like Prussian. Because I didn’t wear jeans much growing up, I didn’t know the beautiful intricacies of indigo (or woad) as a dyestuff. And early on, living under a Florida/Caribbean sky, anything close to Cerulean just did not register as a true “sky” blue at all. But by the time I was a teen, I had seen a bit more of the world and it’s variety of blues. The hues of summer night sky in the British Isles and the color of the Atlantic at rest and during foul, angry storms were in my head. I had lived beneath and experienced the searing blues of the dry air midday sky on the Great Plains; I had marveled as well at the hazy, smoky, just barely blue-grey sky of the southern most Appalachians. So, by the time I became serious about painting, I had decided that Cerulean was OK, Manganese a little bit better, and those new Pthalos, well they were eye-catching but far too strident—almost unmanageable in a realistic painting. I was drawn to Cobalt blue; immediately! I was even more excited by the very rich, deep violet-blue qualities of Ultramarine. My attraction to that ancient color we identify as Ultramarine, traditionally made from lapis lazuli, has never wavered. The bright blue lapis stone, famous and highly valued since even before the Pharaohs ruled Egypt, has been used as a coloring agent and in jewelry. In fact, I wear a lapis lazuli stone on my ring finger every day. (Thanks Mary!) Despite that, the paint color that lapis makes can vary quite a lot depending on the quality of the raw material and the paint maker’s craft. So, for me as a painter, the chemically derived version which is known as French Ultramarine, is much more consistent and preferable. 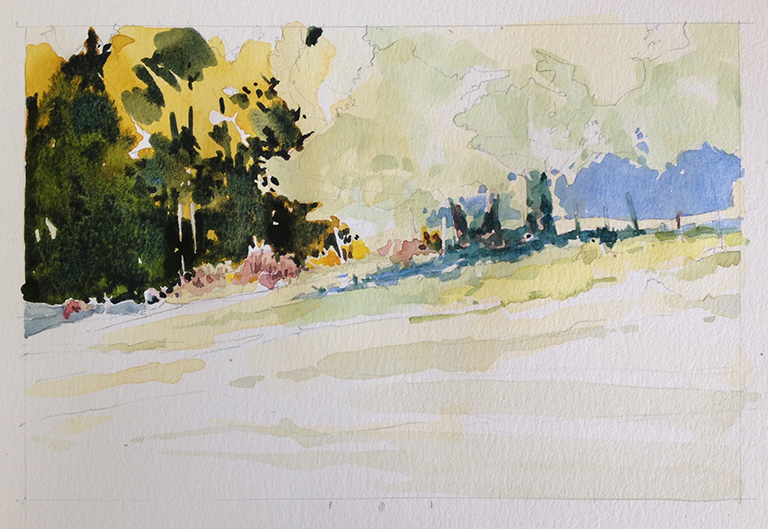 A fairly new watercolor sketch using Prussian Blue, Prussian Green, as well as Ultramarine Blue. But, just before I went off to college, there was a new color on my palette—Prussian Blue! 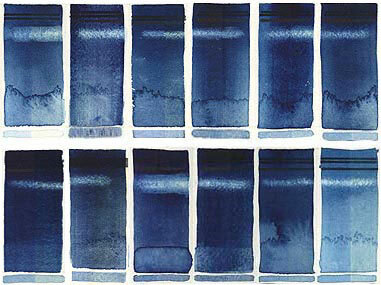 Not a “pure” or boldly simple hue like Cobalt or Ultramarine – nor is Prussian as smoky as Indigo. But it is a rich and complex color, first available as a paint or dye when this synthetic pigment was created in the early 1700s. When I first came across Prussian Blue in the 1970’s, I was painting almost exclusively in oils. At first I thought of it as a sort of midnight blue. 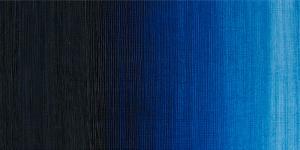 The richness of Prussian Blue oil paint felt mysterious and a bit hard to pin down. Prussian Blue IS hard to pin down. You see, sometimes Prussian just looks like a dark blue … but most of the time it edges towards violet. This makes sense … it is listed as having a red slant in all the official color charts. But under some conditions (in light tints or in very pale washes) I have observed that it can oddly hint at green too. You can see that subtle greenish qualities of the lighter tints of the hue in the color sample above. Violet AND green in the same color? This was astounding to me as a young painter. Prussian is beautiful alone but in combination with other blues it really sang to me, it made other blues seem richer and more harmonious. It also made wonderfully sophisticated light blue tints when mixed with titanium or zinc whites. And because it has a violet quality, as well as its ability to contain hints of green or grey, the colors it can make … especially the greens … that are really beautifully subtle to my eye. Despite teaching color and design to hundred (OK, thousands) of students over the years … and espousing the idea that working with the cleanest, clearest, and purest pigments is the best way to learn about mixing color for a painter … I have a confession to make. When I am actually painting, I still love the slightly less than pure but very vibrant and deeply complex qualities of my Prussian Blue! Recently I learned that, in the 19th C, chemists also created a green by omitting a step in the process of creating the blue. This chemical pigment was used to make a Prussian Green paint. (Later on most paint manufactures replaced it with a mixture of Prussian Blue and Cadmium or Chrome Yellow. Today, most paint companies use a Pthalo (yuck!) instead. I have studied more and more about art and about color over the years; I have also become intrigued by Egyptian Blue and Mayan Blue … as well as Chinese or Han Blues. And what art geek could ignore International Klein Blue (IKB)! So, yes, I love blue, all blues. BUT … in terms of paint, I love a complex and “imperfect” color of paint … Prussian Blue! PS … For those of us who simply love blue, there is a NEW blue pigment out there too! It looks a bit like Klein’s version of the synthetic Ultramarine. And Crayola is going to be the first to use it. I think Gamblin will soon follow. You can read about THAT story at Hyperallergic. 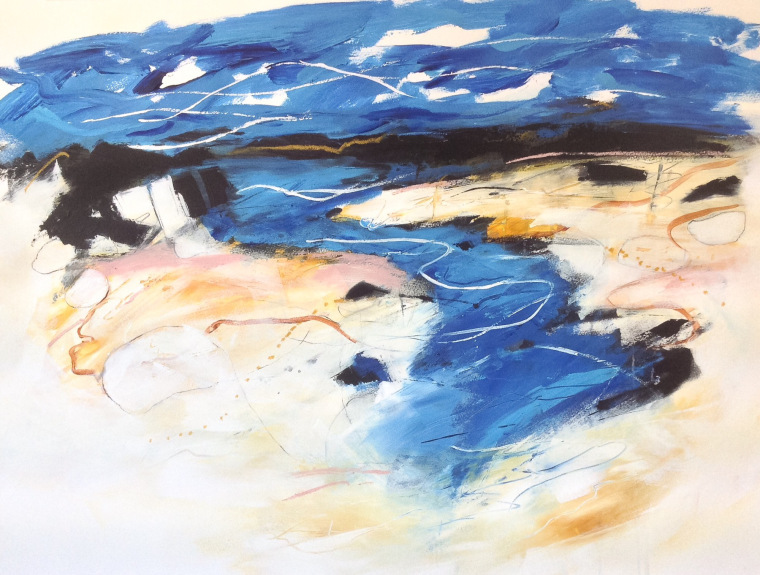 I have been working up several designs for new multi panel pieces recently, pieces for my “Shaped Landscape” series. One of the new challenges is to come up with formats that I haven’t used before. During the winter and early spring months, I spent a lot of time playing on gridded paper. Trying to come up with new multi-panel formats is fun and I am intrigued by several that are radically different from my earlier attempts. There are also some panel configurations that I will try that are tweets of old shape arrangements … but in a new scale or with a very skewed scale relationships. To the right you can see an image which occupies a small portion of a recently started panel. 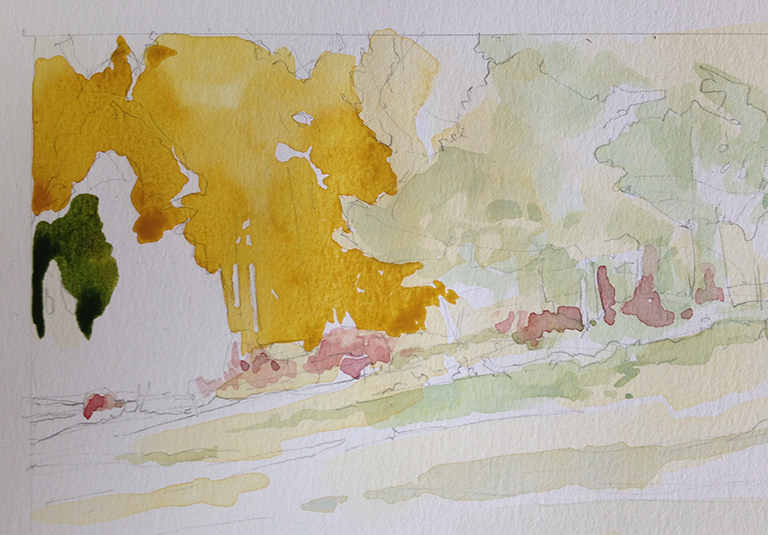 It is part of a new piece using watercolor over pencil … so far. The panel is 12×12. Below you can see the reference photo that, along with my previous on-site sketch, I used while working on this piece. 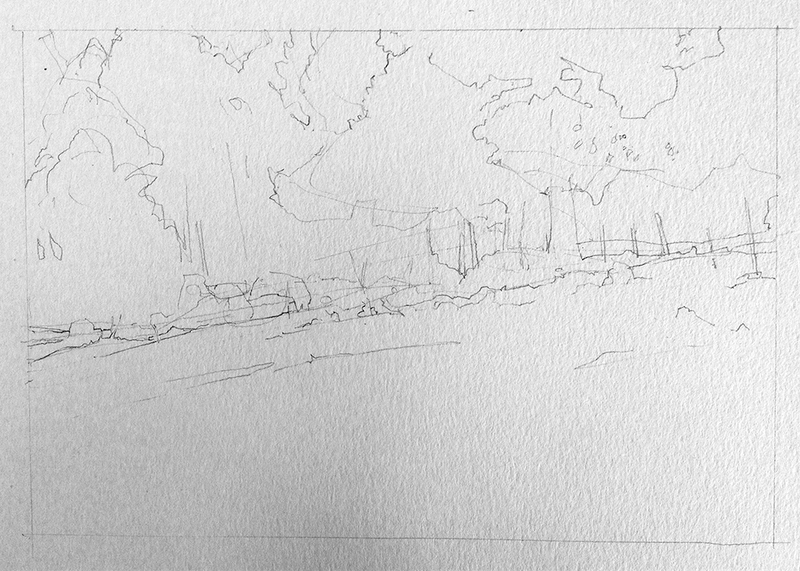 My intent is for this panel to be paired with at least one more panel … probably two or three … that present a wider view of the landscape as well as enlarged landscape details. I am really not yet sure which of several options I am toying with for the overall panel assembly or arrangement. As I said, during the winter I made a lot of sketches and small cardboard mock ups, sort of 2-D maquettes if you will, of possible arrangements of multi sized panels. Frankly I was a bit surprised at some things I came up with … at once simple but more complex than the configurations that I have been using recently. Can not wait to get images that will match up with the new formatting ideas! 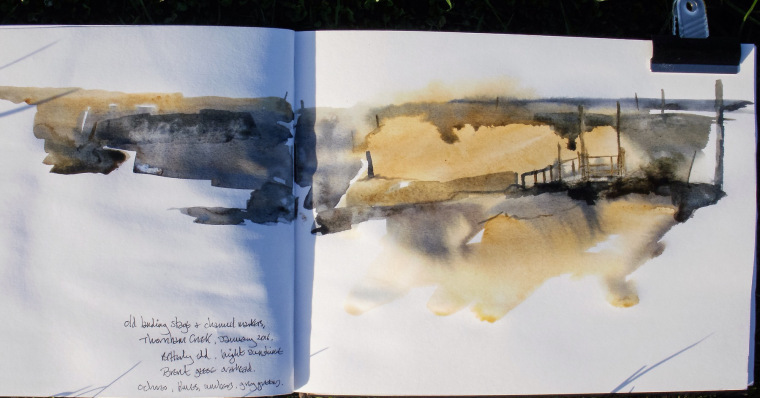 My other project recently has been to get out of the studio, get out of the classroom and be outside sketching, drawing, painting photographing, and writing notes for images. As part of this, I have been drawing more urban images in the towns and cities of my region or in my travels. It reminds me of my youthful endeavors … as a teen drawing the brownstones of Wichita and as a young adult drawing the warehouses and older buildings of eastern NC. 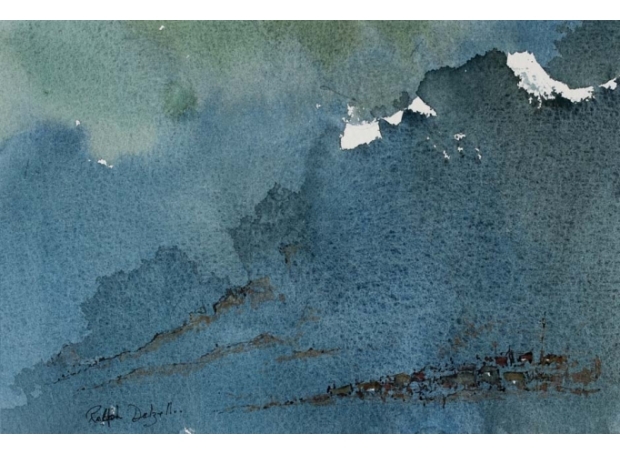 Above are another two recent cityscape pieces … both 5 x 11 with watercolor over pencil. The lower one also has areas of brush and ink and even a little work with a fountain pen. These cityscapes have been fun and I will continue them. While they feel like a diversion in some ways, I suspect that something beyond that will emerge from the work. Just not sure what it will be. 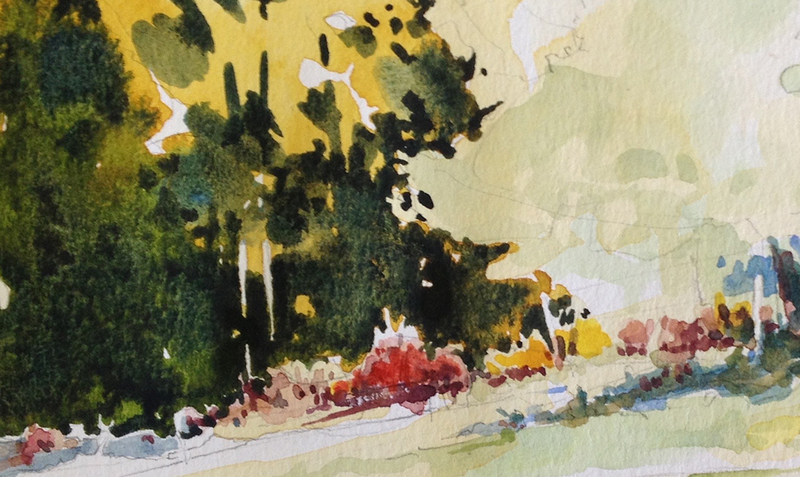 During the past few years my sketches have been more rural; scenes found along the roads, stream banks, and trails surrounding the Blue Ridge. It was that kind of work that I have been doing this week. 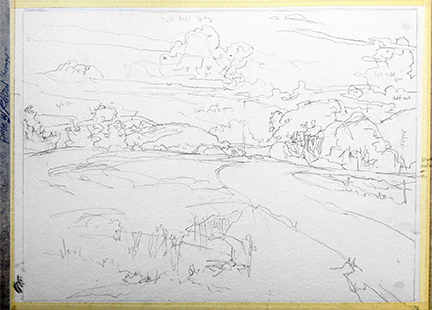 In fact today was pretty productive; I started three more rural sketches this morning and afternoon … though life logistics intervened each time and I didn’t quite finish any of them. Here is the earliest stage of one of them, when it was just pencil on paper. 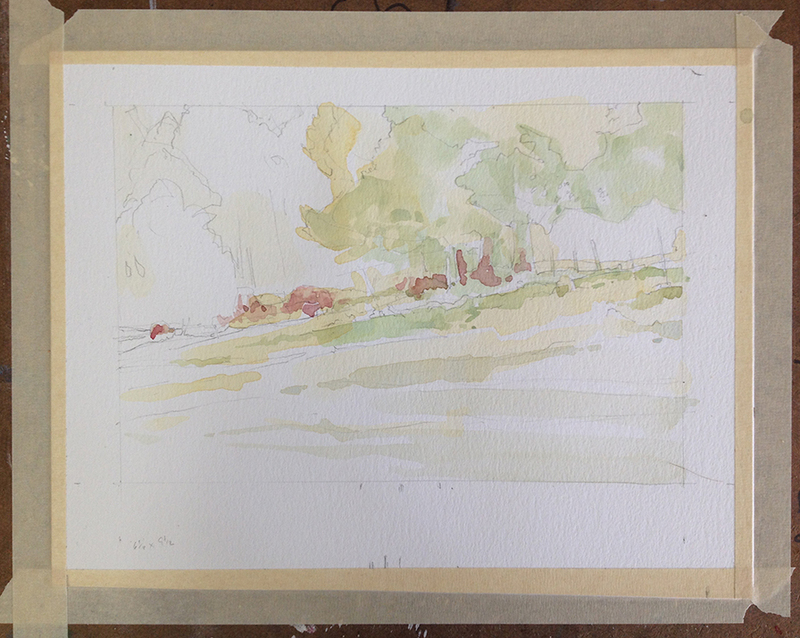 If you look closely you will see notes about color written on the paper … even within the sketch itself! Yes, I will have to erase those before I start in with watercolor. Or maybe just ink and ink wash. I will write more about some these a bit more … but that will have to be later. I need to cook some dinner. I am thinking about Teriyaki chicken and grilled/roasted peppers and onions served over a bed of lettuce … covered with a big handful of red grape halves heated and tossed with black pepper, cinnamon, and bit of cumin seed? Oh Wow … Yes, Blown Far & Away! Like most of us, as a teen, I was hard to impress. Chalk it up to: intellectual arrogance and rambunctious, an overly serious geeky nature, my faux jaded persona, or any other form of silly youthful naiveté that you can imagine. But back then, even before I knew that I wanted to spend the rest of my life making art, I had figured out that art could floor me. Like science or music, art images were able to spin my head around and send me into reveries, into near stupors of joyous confusion and awe. I had a hunger for seeing and knowing through seeing; drawing as a means of understanding the world became central to me. Perhaps because observation was developing into a key pathway, I began to hold Cézanne and Sheeler as exciting and fundamentally important heroes as Leaky and Cousteau were for me. Little did I know then, that instead of the archeologist’s, naturalist’s, or marine biologist’s adventures in scientific exploration that I had envisioned, I would end up in a life of visual investigation and creation. Once I started to move toward making art, my youthfully arrogant and ambitious ego somehow imagined I would be a great draftsman and an oil painter … the next Sargent, Homer, Hopper, Wyeth, or even Diebenkorn. So, while still a teen, I began to study art more and more, even taking classes in drawing, painting, and classically based (dynamic symmetry) design with Betty Dickerson. She was a noted artist and art-educator who, along with her husband, the Regionalist era artist Bill Dickerson, had firmly establish the art school of the Wichita Art Association. Soon I began to fall in love with the late 19th and early 20th century American Realists and Tonalists, French Post-Impressionists and German Expressionists, and most especially … the Early American Modernists. 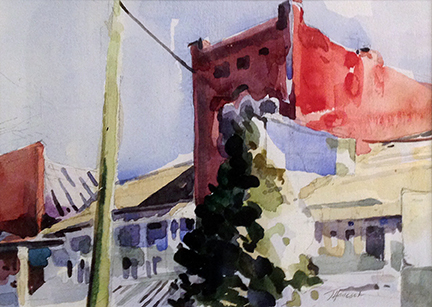 It was only later that I realize all of the artists that I really admired had experimented extensively with and had made major works in watercolor. These artists became formative in my artistic development. And, as many of you know while I adore the act of drawing and that I love painting in all of its many forms … it is the use of aqueous media, especially watercolor, that I intrigues me so very frequently . Well, if I needed a reminder of what it was that pulled me into this particular version of optical overload and vision based thinking, this spring I need have looked no further than the Philadelphia Museum of Fine Art. 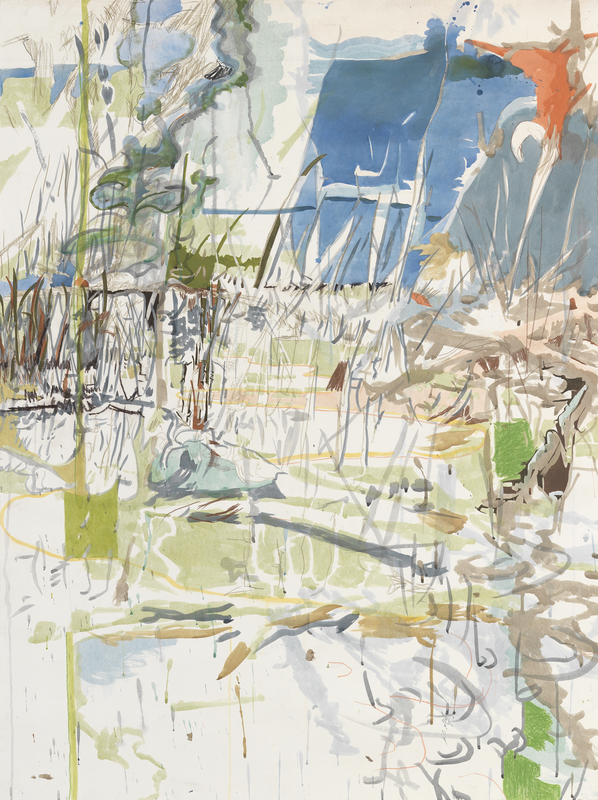 You see, there is an exhibition up in Philadelphia for just a few more days that catalogues some of the very best of American watercolor art. 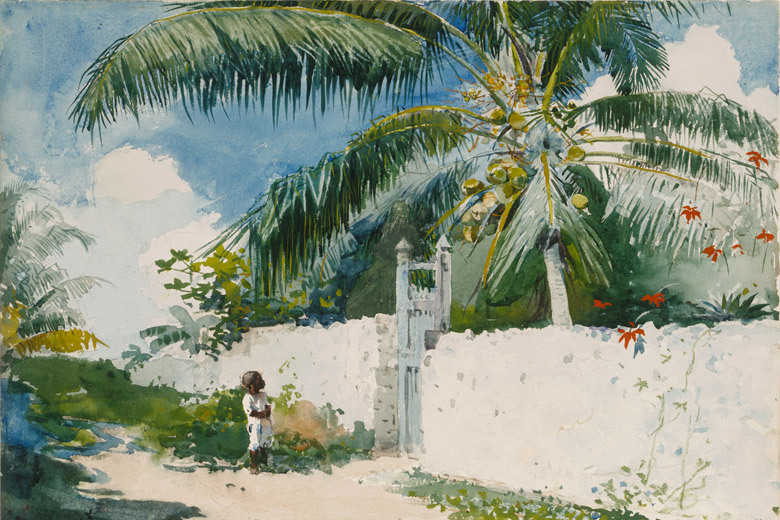 The work runs the gamut of the 19th Century and even sneaks in a few of the best watercolor works from the first decades of the 20th century. There are early artists that I didn’t know well … and even some that I had never heard of at all. 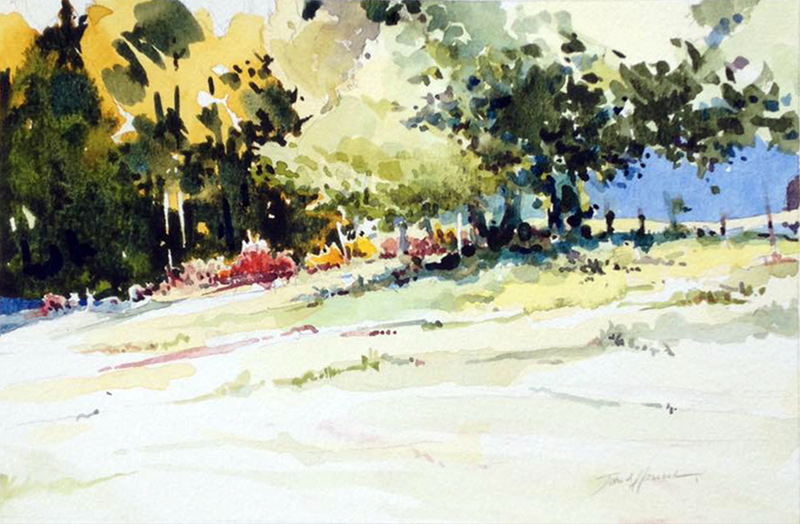 One such artist, George Henry Smillie has a delicious small work in the exhibit. It is a depiction of a beach and the low scrub brush just off the water’s edge. 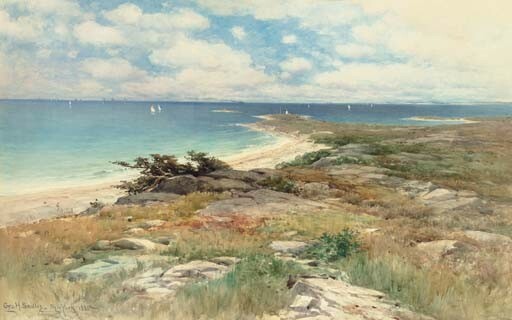 I remember trying to paint similar view when I lived in Florida and Georgia. This one seems effortless. I know it can’t have been. There certainly are pieces that many will recognize as well as a few surprises too. There is one of Georgia O’keene’s Evening Star series and even Eakin’s John Biglin in A Single Scull. I had only seen reproductions of Fidelia Bridges, Milkweeds and Tiffany’s Peonies in the Wind; here they are! Wonderfully idiosyncratic, both of them. I knew of Thomas Moran’s larger than life, heroically-scaled oil paintings. 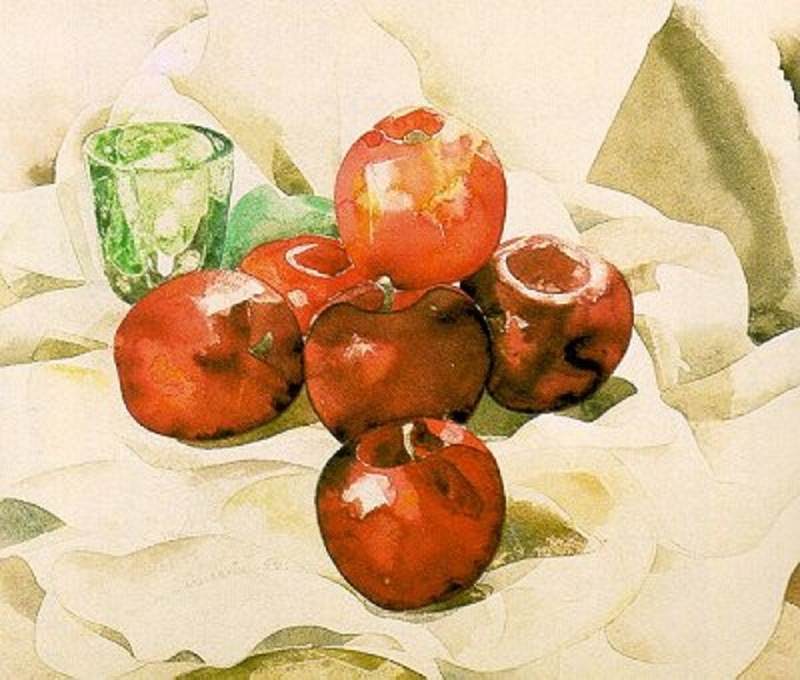 And knowing how artists of his day worked, I assumed he used watercolor as a study and sketching technique. 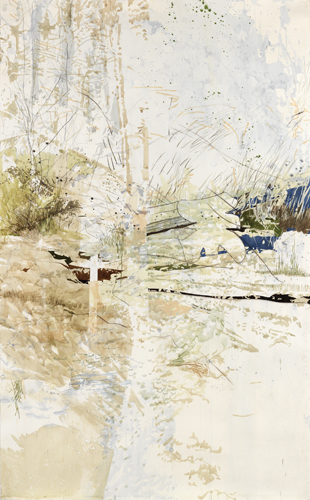 Still his pieces in watercolor surprised me with both their subtlety and their power. While his figures are not always to my liking (a bit too fussy for my taste), the landscapes do not fair badly in comparison to Turner’s. If I were to have any reservations at all about this show, it is that it stops too soon. It is an understandable thing though. I saw a similar exhibit detailing the entire history of British watercolors (Watercolour, Tate, 2011) … if you want to read about that show, see my blog posts from August 18th and August 20th, 2011. That show ran on and on, and while I was in heaven, it was huge. Whether you are looking for an excellent reason to be in Philadelphia (besides Rodin, a cheesesteak, the Liberty Bell, to sip a Yards, to see all the construction going on) or you just want to take in some of the best watercolors 19th and early 20th century America offered up … check out the American Watercolor exhibit at the PMFA. You only have a two weekends left! PS: If you can’t make it … the catalog is excellent. A near rival to the big book detailing the whole history of American Watercolors by Christopher Finch back in 1986. Well, there you go! The winter of 2015/2016 was a a mess. Water, water, water, and finally more water. Four plumbing based floods atop some poor construction decisions (years before we ever bought the space) added up to disaster! Our walk out basement household storage area, the utility room, my studio storage and both the small work studio and the large studio (the converted garage) were effectively un-usable! It might not really qualify as a disaster, but it was certainly a serious dose of family and professional disruption, a messy state of affairs! That has been the story around here; for close to five months now! The large painting space where I work on the mylar drawings and larger works on paper, and the early drawing phases of the multi panel pieces. Isn’t that a lovely hole where water damaged the baseboard and lower portion of the wall! Slowly and expensively, we are getting things in order. These photos will give you some indication of the level of tear down we had to endure to get at all the problems. With this much work, it shouldn’t surprise any of my readers that we found more problems as we went along. Joys were heaped upon joys. Here is a view from the family storage area, past the mechanical and electrical utilities room … behind the heating and ac units is the hole in the wall we saw in the last picture. You can see where we have already begun to rip down the interior wall as well. View from the small painting space and the foot of the stairs, past the studio storage area and into the main portion of the basement storage area. It is a big empty space now. All the wall materials have been removed and we have only just begun to reframe the space. We’ve also had some wonderfully skilled technicians here; I interviewed a number of new contractors for some highly technical work. It was really good fortune to meet a couple of helpful structural engineers and to work with my favorite local contractor again. (It is just to bad it wasn’t something on our list of “desired” projects!) I have also gotten to know the ins and outs of our space SO much better too. Now, slowly things will begin to get back to normal. I’m on the verge of being able to work a bit in the big studio. I will have to patch that wall between it and the utility room first; I’ll need to repaint the walls, doors, and floor. Then I will have to tape, mud, and paint the new drywall in the small studio. With that done I can begin to move some of my painting supplies of the dining table! Mary has been SO patient and accommodating. This is the opposite view of the small studio space. Above the door is one of the pipes that ruptured and flooded the space. That leak damaged the door sill, frame and drywall. I will also need to finish the newly repaired wall between utility and main basement space. While I lost a few pieces of studio equipment, none of it was crucial “stuff.” I did lose some really nice paper and supplies … a number of art books, and four or five 20-30 year old sketchbooks too. The destruction of the sketchbooks is more than a little disheartening; it really hurts. I had hoped to pass those down to my illustrator daughter. There will be joy though. I will have to get some new supplies of paper and such. New toys! The studio budget will be tight … but that is just how it is. It is another chance to be flexible and creative! 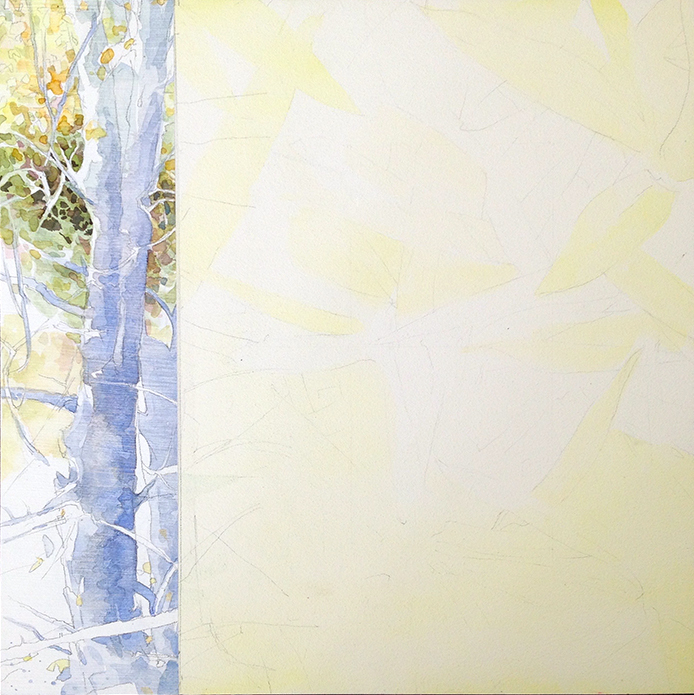 a small 6×12 panel, part of a diptych I am working on … more on that a little later! I have to wait to ramp up production of multi-panel pieces for my fall solo show just a bit longer. I have been working on a few while teach my various classes. but that is a bit sporadic. Luckily … Spring is now here. 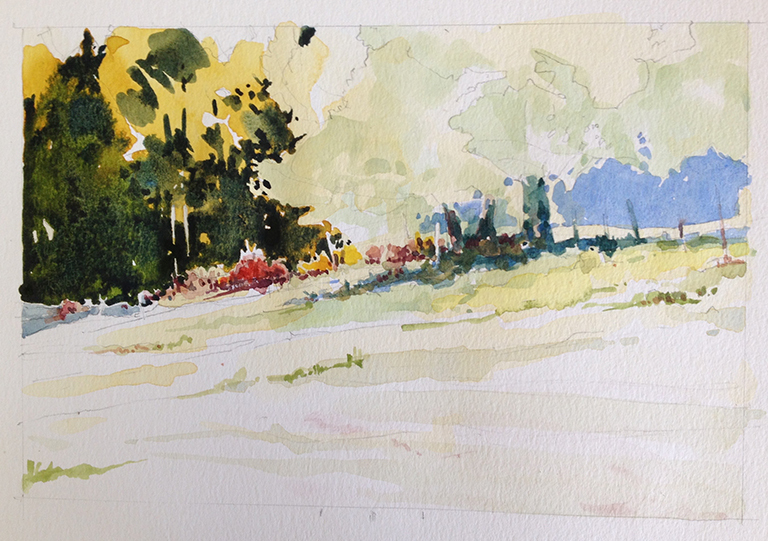 I can more easily work on watercolor sketches and individual small watermedia panel pieces outside. But it is time to get the bigger pieces off the ground; there are only 4 1/2 months to go! Well, a bit of kvetching, some pride in the new and shiny parts we have gained, and a bit of hope that we never have to walk this crooked path ever again! The main studio … in happier days. Looking forward to a return to normal!